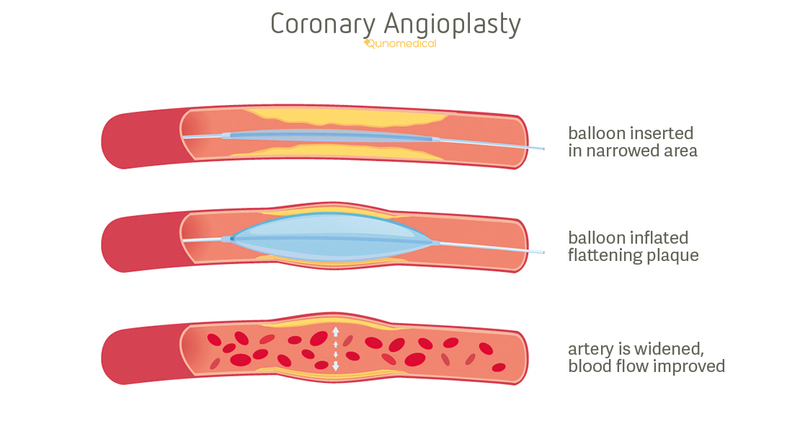 A percutaneous transluminal coronary angioplasty (PTCA), is a minimally-invasive coronary procedure aimed at widening blocked coronary arteries that serve your heart. People with narrowed arteries around the heart. People with hardened arteries around the heart. People who need emergency treatment following a heart attack. Around 90% of patients live for at least five years after an angioplasty. Around only 12% of patients who undergo angioplasty go on to have a heart attack within five years. Back home: on the day of the procedure or the day after. Back to work: around a week after a scheduled angioplasty. If you're having an angioplasty as a result of a heart attack, you might require a recovery period of several months. Bleeding and bruising where the catheter was inserted. An allergic reaction to the dye used during the procedure. An angioplasty involves the insertion of a catheter in a wrist, arm or the groin. In order to widen the clogged artery, a tiny balloon is temporarily "inflated" through the catheter. The balloon helps your blood to flow freely. If necessary, a stent (wire mesh tubing) is inserted at the same time to keep the artery open. This procedure is performed by a cardiologist and a team of specialized technicians and nurses. A PTCA is aimed at preventing heart attacks and other heart-related events and conditions. Here’s a step-by-step description of how an percutaneous transluminal coronary angioplasty (PTCA) typically works. You are given a local anesthetic to numb the pain caused by insertion of the catheter. The catheter is inserted through your groin or, alternatively, arm or wrist. General anesthesia isn’t needed. This means you are awake throughout the procedure. After numbing the insertion area, the doctor will make a small cut in your skin. The catheter enters your artery and it is passed slowly through your artery with the help of a special dye and an X-ray video. Once the balloon on the end of the catheter has reached the blockage, the surgeon inflates it. This widens your artery and presses fatty deposits against the wall of the blood vessel, ensuring blood can flow freely. The balloon is then deflated and very gently pulled back out. If you have several blockages, the doctor will repeat the procedure at each blockage. Are there different types of angioplasty? While the balloon angioplasty is the most common, there are other options available to surgeons. Which one is chosen depends on your specific needs, as well as your medical history. If you are scheduling an angioplasty, you will discuss your options with your doctor. Laser angioplasty works similarly to the traditional balloon procedure. However, instead of carrying a balloon, the catheter carries a laser. This highly accurate laser can be used to destroy fatty deposits (plaque) in the artery - thus clearing the blockage. Plaque is removed layer by layer and converted into gaseous particles. A coronary atherectomy also involves the insertion of a catheter. However, instead of inflating a balloon, the surgeon uses specialised instruments to gradually cut away at the plaque. There are also versions of the procedure that use a balloon in addition to the specialist tools. While there is risk involved in any surgical procedure, the chances of anything going seriously wrong during the procedure are very slim. Nevertheless, this can be a very distressing experience as people remain awake during the entire procedure. And although local anesthetic is administered, patients still report significant pain and discomfort. Expect to feel some pain and discomfort for a few days after the procedure, particularly around the point of entry. This is a stressful experience to go through, and it can be an emotional one too. Ask a friend or relative to be there for you before and after the procedure as you might need emotional support during what can be a distressing time. Qunomedical Health Managers have an all-round knowledge to find the right specialist for you. Learn more about Qunomedical. Check out our curated list of tips and things to keep in mind before, during, and after your treatment. Follow your doctor's advice on when you can eat and drink before your procedure. Pack an overnight bag, just in case you have to stay in the hospital for observation. Try to remain calm; prepare yourself for a potentially stressful experience. Listen to what the doctors ask you. You might need to move during the procedure. As the balloon temporarily blocks your blood flow to part of your heart, you might experience a little chest pain. Don't worry, this a normal part of the procedure. You may need to lie still for a period of time after the procedure. Make sure you comply with any requests from your surgeon. Get a friend to take you home. Give yourself a week to recuperate before returning to work. Report any chest pains or adverse effects to your doctor immediately. Find below the most frequently asked questions on percutaneous transluminal coronary angioplasty (PTCA) and information about Qunomedical. Qunomedical is your gateway to high-quality medical treatments and internationally-accredited clinics worldwide. We connect you with professionally-vetted physicians anywhere in the world and prepare personalized, free and non-binding treatment quotes for you. From booking your appointment to following up on your recovery, we offer continuous support throughout your medical journey, and are available 24/7. Get in touch now. Getting a quote with Qunomedical is easy, fast, and free. Whatever stage you are at in your research, you can send us a request via our form, give us a call, or send us an email. One of our Health Managers will be in touch to discuss your options and send you a free, non-binding quote for your preferred location. Get in touch now. How many angioplasty surgeries can you have? A small percentage of patients will need to undergo a repeat of their angioplasty procedure as a result of the artery narrowing again. However, if a second procedure fails, a surgeon might suggest a coronary bypass operation. How many procedures are performed during the same surgery depends on your health, the nature of your blockage and the initial state of your arteries.